While I’m very musically inclined, Trello is not related to a trumpet combined with a cello, despite what its name suggests. One of my clients started using this tool to help track features on our current project and steps we need to take for those features. While using it for this client, I’ve found multiple uses for it, so I figured I may as well blog about the handy online tool known as Trello. What’s nice about using Trello to track things like this is that you can assign points to cards and use browser plugins – such as Trello Scrum for Google Chrome – to help get lane totals, which are helpful if you need to calculate velocity or other metrics. Labels – used however you may want to use them. Be it using labels to identify larger features, priorities, risk levels, or some other piece of data. Cards can have multiple labels. Assignments – used to see who’s assigned to work on the card. Multiple people can be assigned to a card. Checklists – used for lists related to the card. Great for keeping track of steps and resources to complete a card. Attachments – good for attaching files related to the card. This is good especially if, for example, you have a gherkin file associated with the feature. Vote – good if you have a team of people looking at features and wanting to vote on which features get in a release, for example. Trello is also a project that is continuously maintained. Not only do they continue to work on Trello, but they use Trello to manage Trello development – check out the Trello Development board. In addition to using Trello to track the various features and who’s working on each of them for our project with one of my clients, I’ve also decided to use it for my business overall. 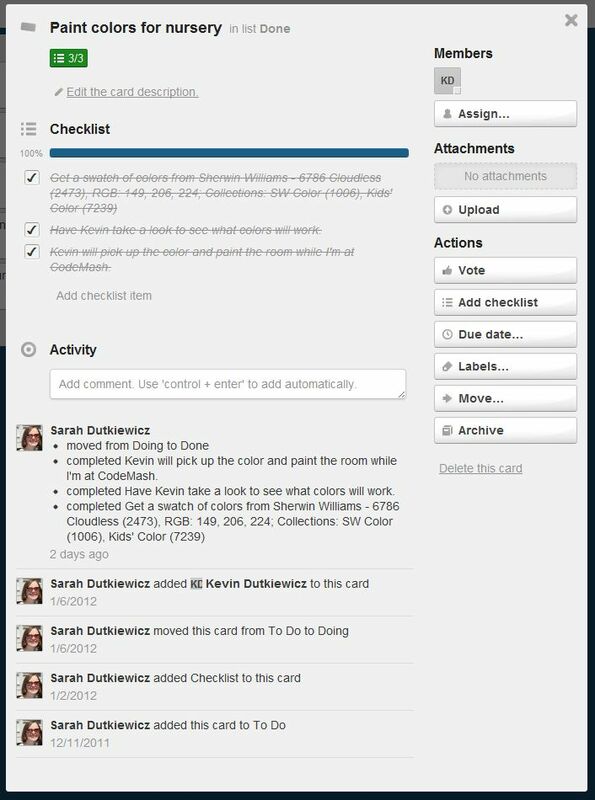 My Trello boards for my business – Cleveland Tech Consulting, LLC – help me to get a better view of the picture overall. I have a board that I call “Business Pipeline”. This is where I keep track of my various contracts with my clients, as well as potential job leads. I have another board that I use to keep track of some of the apps that I’d like to work on if I had more time. This helps me to at least get my ideas down somewhere where I can revisit them. Overall, these boards help me see the big picture of the flow of my business. Whether we need to register for something, purchase something, or preparing something in the house, it’s all getting added to the Trello board. So far, we’ve found this helpful – be it tracking pediatrician recommendations, writing down specific color information for the nursery, or even storing links of nurseries that I like for inspiration. I’ve found Trello to work well for what I need. I like a simple way of organizing my features and tasks, be it software development/architecture or otherwise. Trello is my choice, and I’d recommend others to try it out and see if it may meet your needs as well.